HD video on the move: which platform is best? Sony's Vaio might be the most expensive of our notebooks, but its screen is worth the price. Support for HD video is old news on desktop PCs, and it's not unusual on high performance laptops with powerful discrete graphics adaptors, either. 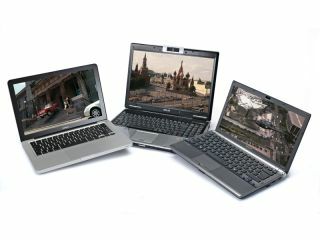 But until very recently it had not been part of the standard feature set for mainstream portable PCs. Here we examine which of these three major mobile platforms is the best for watching HD movies on the move. We also want to find out which has the best feature-set for using a laptop as a portable HD output device that can drive CE-quality playback devices such as big screens and projectors? Finally, we will also consider the 3D performance of these new mobile chipsets; the importance of gaming grunt should not be forgotten. First up is AMD's latest mobile platform, codenamed Puma. The key element is the new 780G mobile chipset and its Radeon HD 3200 integrated graphics. In 3D terms, AMD claims that it's three times faster than Intel's latest mobile integrated solution. It also supports Hybrid CrossfireX graphics, enabling a discrete GPU to be run in parallel and therefore offer the best of both worlds. On mains power, the discrete GPU is fired up for maximum performance. Switch to the battery and the integrated graphics deliver extended battery life. As for HD support, the big news is the inclusion of ATI's full AVIVO HD hardware decode engine. Consequently Puma boasts exactly the same features found on ATI's high-end desktop GPUs, including hardware decode of the all-important VC-1 and AVC codecs, as used on Blu-ray disks and several other premium high-definition platforms. Finally, Puma packs full support for HDMI video output and therefore HDCP content encryption, though these are features that need to be 'exposed' by laptop manufacturers. In other words, not all Puma laptops will have HDMI ports. Puma does, however, have a weakness: the latest Turion X2 Ultra processor creates a performance shortfall. Its execution cores are carried over largely untouched from AMD's previous mobile chip. Even the moderate upgrades to floating point performance that AMD added to the Phenom desktop CPU architecture do not feature. The problem here relates to playing back HD content encoded with codecs that are not supported by the Radeon HD 3200 chip. But more on that in a moment. Next is Nvidia's brand-new GeForce 9400M. Nvidia, of course, does not make its own CPUs – not yet, at least. So the 9400M is designed to hook up with Intel's Core 2 processors and take the fight directly to Centrino 2. Architecturally, its funkiest feature is the fact that it's a single-chip solution. The Northbridge, Southbridge and graphics – along with everything from the memory controller and disk controllers to the PCI Express interfaces and 3D pipelines – are packed into a single chip.That's ideal for a notebook PC. It should also translate into superior power consumption. In fact, it's a wonder that Intel doesn't do a single-chip Centrino platform. Thanks to the 9400M, even the latest Centrino 2 platform already looks rather dated. The 9400M's 3D grunt is delivered by 16 of Nvidia's finest shader units. Nvidia says that it's the fastest integrated GPU available – but don't get too excited. Compared to Nvidia's desktop graphics chips, which top out at 240 shader units, it's still pretty feeble. Elsewhere, it's pretty competitive as a platform with Centrino 2 thanks to a 1,066MHz CPU bus and DDR3 memory support. But what of the 9400M's HD video cred? Hardware video decode is handled by Nvidia's PureVideo HD engine, and it mirrors AMD's AVIVO decoder with full VC-1 and AVC support. After a troubled start with the GeForce 6 family, PureVideo has improved enormously. Again, the 9400M is wired up to support HDMI and HDCP should vendors choose to offer those features.